I call this “Naan style” because like Naan, this pizza dough is made with yogurt. This recipe makes a nice thin, crispy pizza crust that does not dry out. I use a bread machine to knead the dough. This recipe makes a lot of dough, so you’ll need to ball up smaller portions, wrap them in saran wrap, and freeze them. 1Add your wet ingredients to your bread machine, and then add the flour and remaining ingredients. 2Set your bread machine to "dough" or "mix." DO NOT bake the dough, you just want to use the machine to knead the dough. 3This makes way more dough than you need for a single pizza. 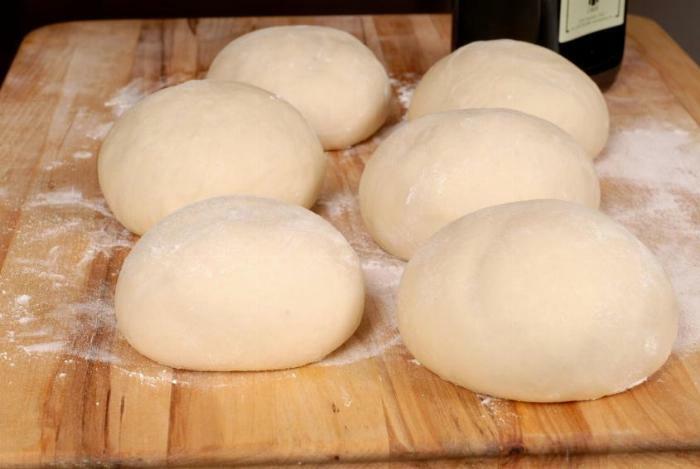 Pull off one 4 to 6 ounce piece of dough for the pizza you're about to make. Then break the rest of dough into 4 to 6 ounce dough balls, or the desired amount you need for your pizza sizes. 4Add a couple of drops of olive oil to a roughly 10x10 inch piece of saran wrap. Roll the dough ball in the drops of oil, then wrap the saran wrap around the dough. Twist the saran wrap ends and tie the ends together. You'll figure this step out as you do it. Then put the dough balls in the freezer until ready to use. 5When making your pizza, dust flour onto your dough rolling surface. Roll your dough out until it's thin and fully stretched. Let the dough rest for 10 minutes (it won't rise). Roll again until dough is thin and fully stretched. 6I like to slightly bake this pizza dough before adding the pizza sauce and toppings. Pre-heat your oven to 400 degrees F. Bake the dough on a pizza stone for 1 minute. Remove the dough from the oven, flatten any air bubbles. Flip the dough and bake for 30 more seconds. 7Flatten any air bubbles again and then add your pizza sauce and toppings.